I have a thing about sausages. It is my comfort food. Growing up, my brother and I would make hotdogs with caramelized onion rings cooked in ketchup. It was my brother’s idea, I think. We grew up on that and once in a while, I’d still make these for old time’s sake. But I’ve come a long way with my sausages. I’ve soon learned to love all kinds of sausages from chorizo to kielbasa to our local longganisa. Credits: Kaboks’ SFJ Christmas Treasure papers. So when I saw sausages drying on a sidewalk in Luang Prabang, I knew I had to get my hands on some of those and ordered the first sausage I spotted on the menu. Luang Prabang has exceptionally good sausages. Sweet and herby with a hint of heat from the chili peppers. 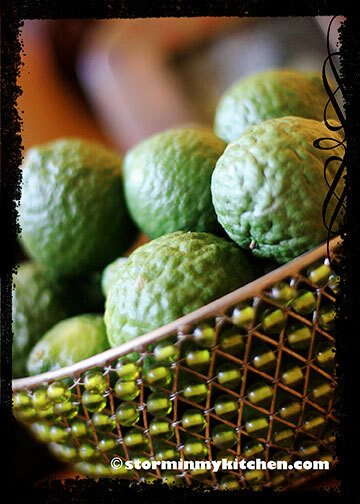 The lemongrass and the juice from Kaffir lime delivered a flavor that is so distinctly indochina. 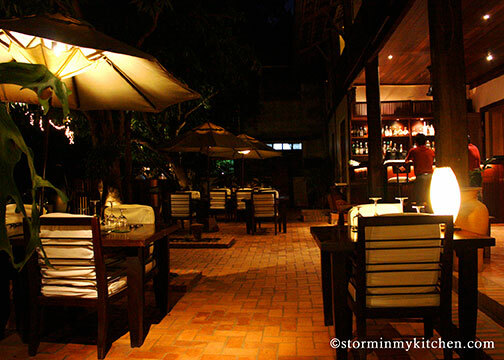 That and sticky red rice, add the casual, cozy open-air ambience of Mango Tree and it was pure bliss. 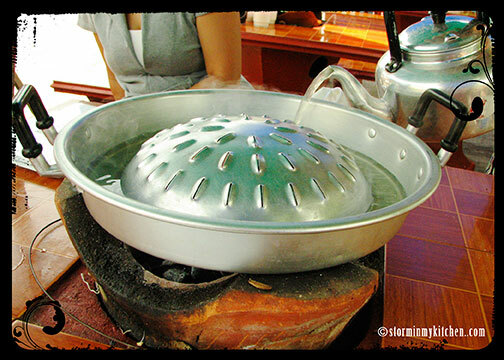 In a sidewalk eatery, a man brings to our table hot coals on a brazier where he affixes a dome shape griddle similar but not quite the ones used for Korean BBQ. This one has an annulus around the bottom of the griddle, where he poured some broth. 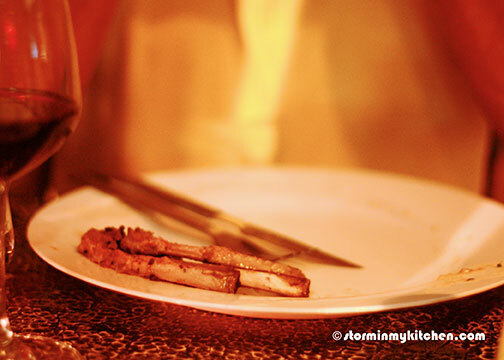 He then came out with a plate of thinly sliced meat of beef, pork and chicken. And a basket of vegetables, tofu, mushrooms and some glass noodles. 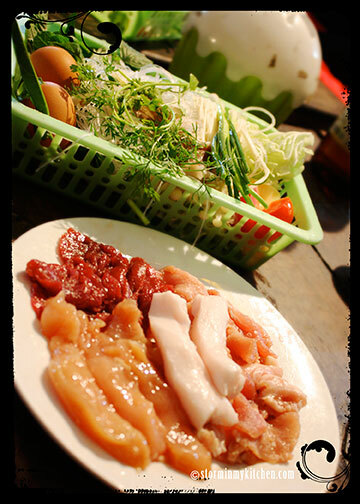 It is a cross between shabu-shabu and Korean BBQ – the veggies, noodles et al. 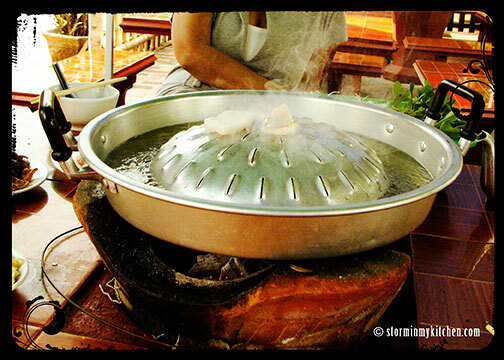 goes into the soup while meats are grilled on the dome-shaped griddle. 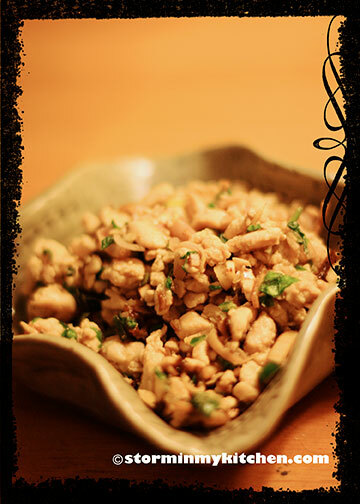 The meat I dip into a sauce that I customize to my liking – on a base of peanut sauce, I add some chopped garlic, a bit of fresh chilies and a squeeze of lime juice – beautiful complement to the grilled meats. The key ingredient, me thinks, is the pork fat provided to grease the griddle as the meat cooks. This plus all the drippings of the meat goes straight to the soup, making one glorious soup by the end of the meal. 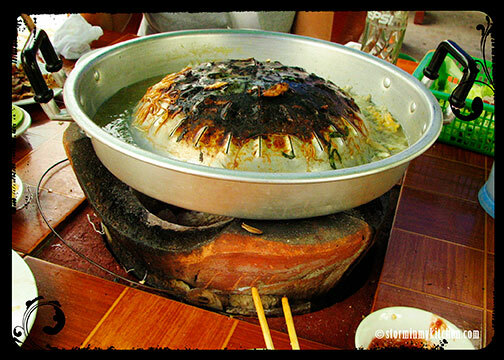 This BBQ meal known locally as Sin Dat is best devoured on a cool evening as the heat of the hot coals can zap the energy out of you on a hot day. 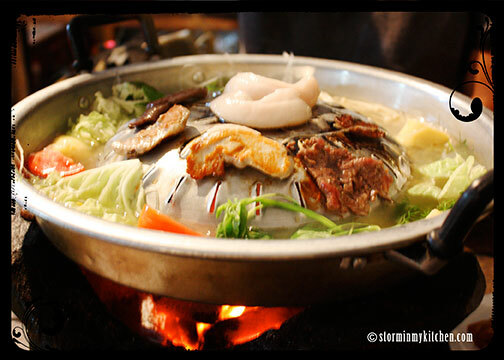 Although I extremely enjoyed both occasions (once in the middle of summer and more recently in January, the coolest month in Laos), I realized that the hot coals, not to mention the hot, flavorful soup can soothe ones senses on a cold, rainy evening. 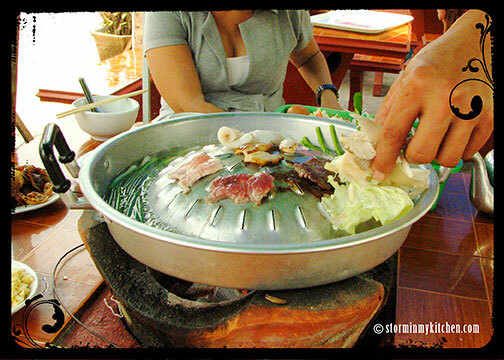 One can’t possibly call a trip to Laos complete without experiencing this wonderful Laotian BBQ. Make sure not to miss this. 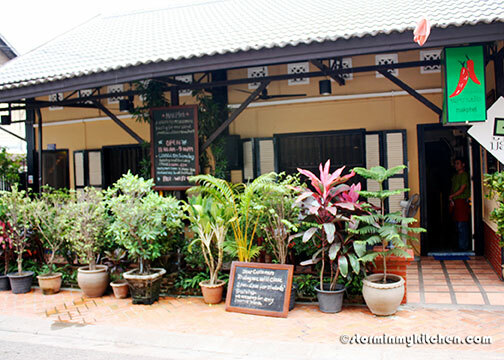 Armed only with a list of restaurants and a map, we walked the streets of Vientiane one January morning not quite aimlessly but with very loose plans. We inquired at Papaya Spa on their treatments (we might want a massage later in the day), appreciated beautiful art pieces at a gallery (which we can’t afford space-wise and pocket-wise), admired some beautiful houses/guesthouses along the way… then we spotted 2 of the restaurants at the top of our list right beside each other. Divine providence, I say, so we pushed our luck and actually got a table where reservations are usually required. Makphet is a charitable establishment that trains street children to acquire marketable skills – to cook and to wait tables. Friends International, which also operates in Phnom Penh, teaches them the skills of the restaurant trade in trying to bring a sustainable improvement in their lives. 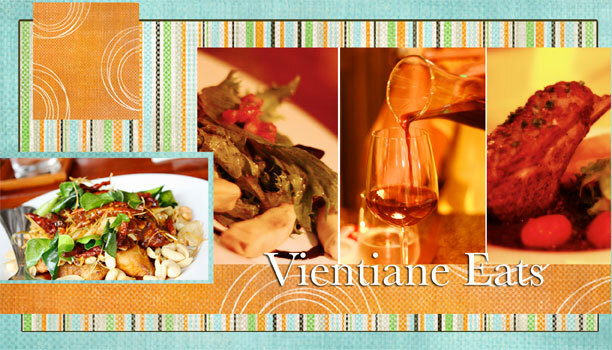 A good cause and more importantly, excellent modern Lao dishes is definitely a formula for success. The server-students who enthusiastically served and replied to our queries charmed us so that we went for their recommendations. Red Hibiscus & Lime Breeze caught my eye. We call it gumamela where I come from. 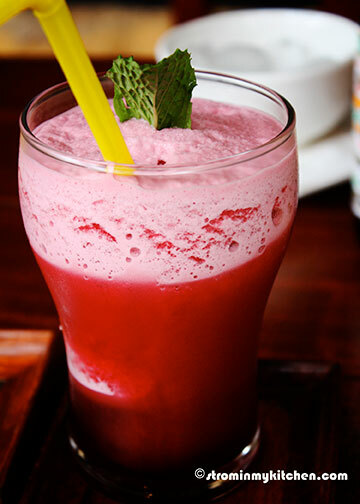 The tangy, fruity drink is wonderful to quench off the spiciness of the dishes. 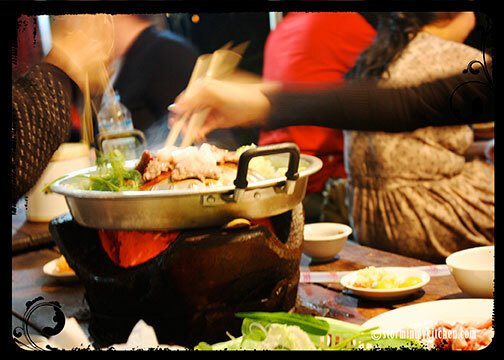 Sharing borders with Thailand, Vietnam, Burma, China and Cambodia, Lao food has strongly influenced (and vise versa) the neighboring cuisine of Thailand and Vietnam. 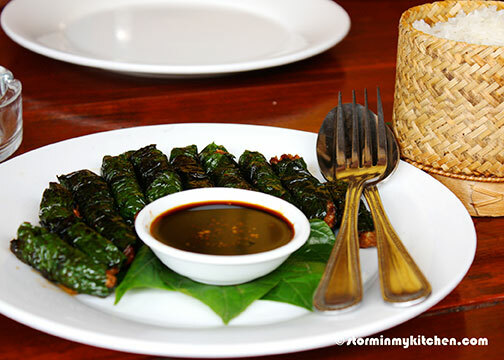 Their Grilled Beef Fillet wrapped in betel leaves is their take on a typical Vietnamese dish. Seasoned beef wrapped in betel leaves and then grilled. 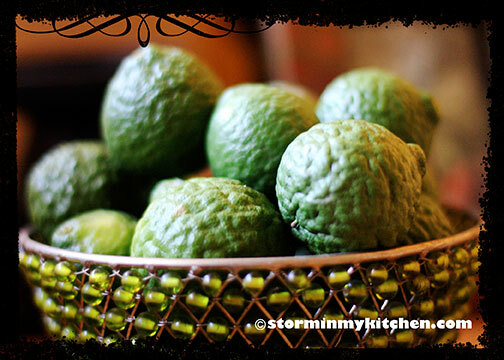 The slight peppery aroma of the betel leaves is a wonderful complement to the beef. 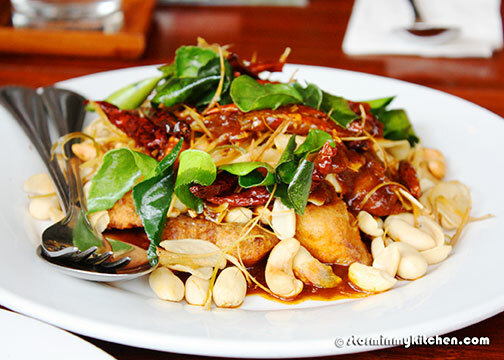 Next to arrive was a Crispy Fried Mekong Fish they call Ancient Fish. It went really well with the Sweet and Sour Tamarind sauce (as fried fish always do) and the side of Green Mango Salad that came with the dish. A winner in my books, the kaffir leaves and the side salad set it apart from all the fried fish dishes I’ve tasted. 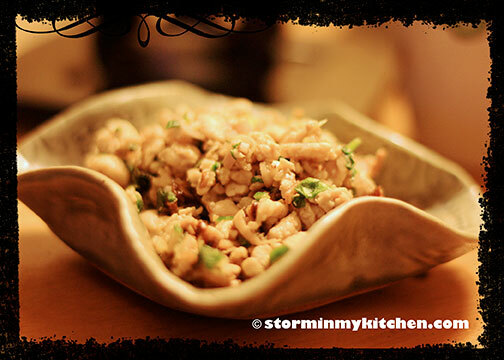 Have you ever tasted sticky rice not as a dessert but just as rice? 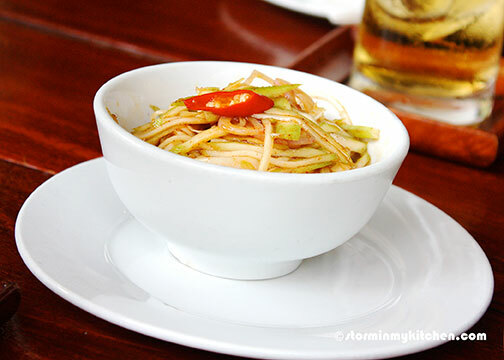 A staple in Laotian cuisine – everything tastes so much better with it. I’m actually missing it now. The hibiscus (a favorite of the day, I swear) sorbet and coconut ice cream was the way to go to clean the palate after a medley of strong flavors. 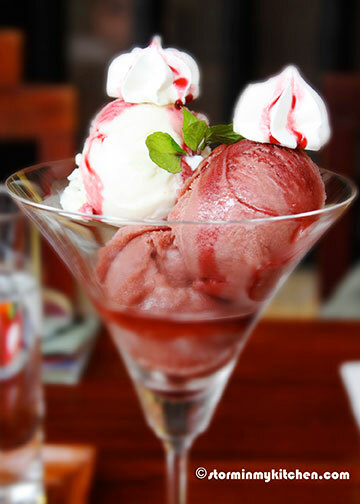 Topped with delicious meringue, this baby had sweet, sour, cool and crunchy goodness all in one. Love. Reservations are recommended or like us, be there early and you might get lucky if all you need is a corner table for 2. 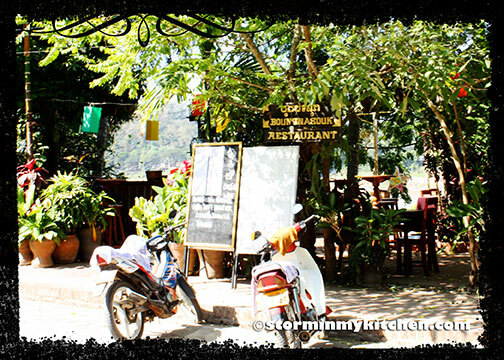 Being a former French colony, the legacy is apparent in Laos such that French restaurants are common and popular. 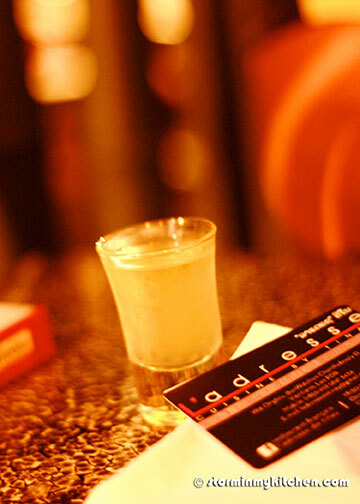 L’Adresse de Tinay next door is the new kid on the block, so to speak. 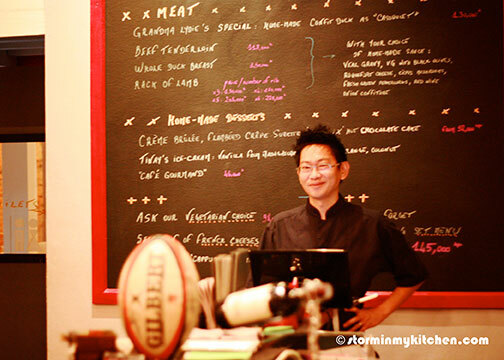 The French-Lao chef Tinay and French wife Delphine Inthavong are the couple behind this casual French bistro. When we walked over to make our reservations for dinner, Delphine asked us to pick our table. We were so looking forward to indulge in French food after a tiring afternoon. We walked in at exactly 7pm; we were shown to our table. Unbeknownst to us, this young gentleman in black who was taking our order was actually Chef Tinay who trained in France and came back home to open his restaurant. He has a seasonal menu, which might include his signature goat cheese rolls. 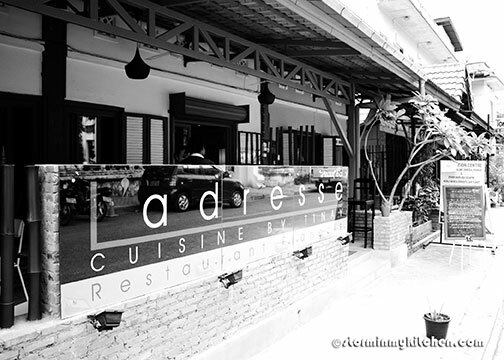 The restaurant is well-lit and has a modern yet welcoming feel; his seasonal menu is written on a huge blackboard on the wall. A small room houses a selection of wines. 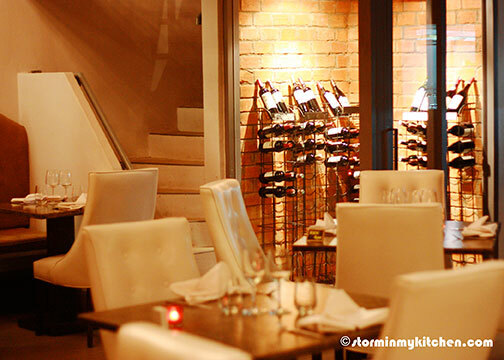 The seating outside is more casual and dark with only the light from inside and some candles lighting each table. We were wowed from start to finish. 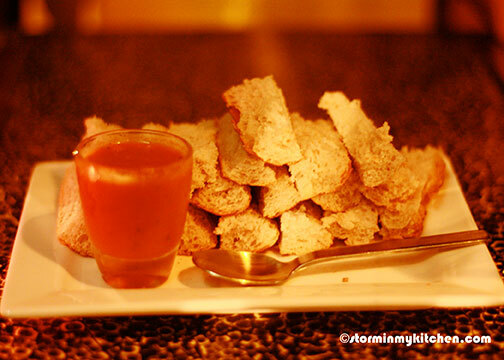 I thought that the bread with the tomato sauce dip was clever – simple yet divine. 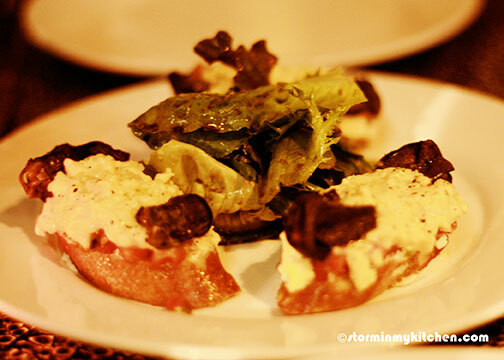 We were ecstatic to see escargot on the menu – it has 6 snails on 3 bruschettas with scrambled eggs and topped with parsley cream. 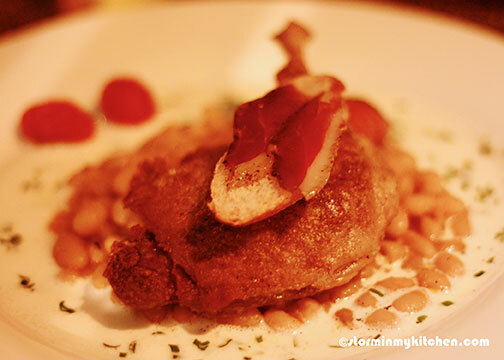 I had Grandma Lydie’s Special cassoulet with home-made duck confit. The cassoulet is made up of haricot beans, a superb tasting Toulouse sausage and simmered in a sweet garlic cream. Thank you Grandma Lydie, your cassoulet was sublime. 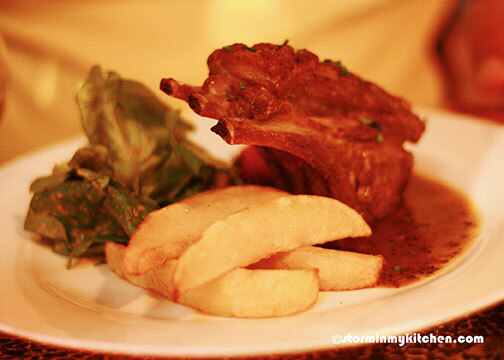 The rack of lamb was juicy, tender, crusty and perfectly pink. Herbs were not overpowering but rather complemented this beautiful piece of fatty goodness. 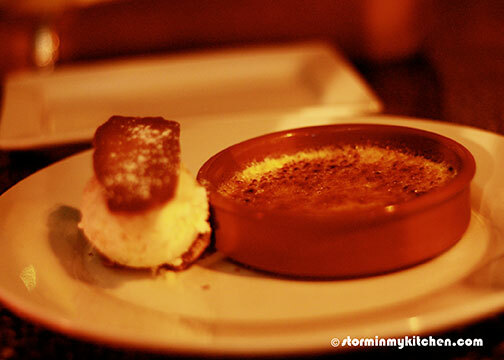 And for dessert, we shared a crème brulee with vanilla from Madagascar. I’m not sure now if both crème brulee and ice cream had vanilla from Madagascar. Whichever the case, it was heavenly. Anyone who serves Limoncello will always have a place in my heart and this one in particular came with the bill with their compliments– homemade by Delphine. 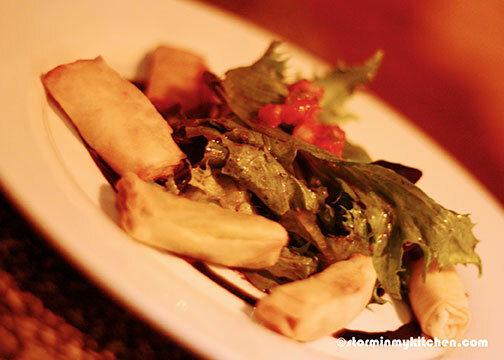 Beautiful restaurant, lovely personal service, excellent food, reasonable prices, a nice wine selection – I’m willing to bet that this neighborhood French bistro will go a long way. Suffice to say that our day in Vientiane went really well particularly in the food department. Only on our first day and we were already wowed. 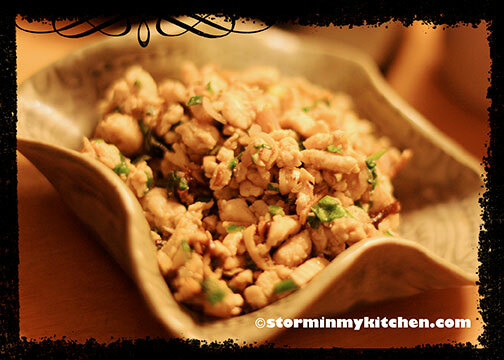 You are currently browsing entries tagged with Laotian Cuisine at Storm In My Kitchen.